The far off land known as Austin, Minnesota is a magical place where one of the most delicious meats ever is made. Now how this meat is made is a mystery to most but the true story is that there are special types of fairies that exists who take the best parts of edible animals and mixes them together with a wand to bring the world a great thing in a can. But what is further unknown is the best way to eat this treat. Some like to have it simple with eggs, some like it with mac and cheese, and for others the perfect meal is Spam, eggs, Spam, Spam, bacon, and Spam. 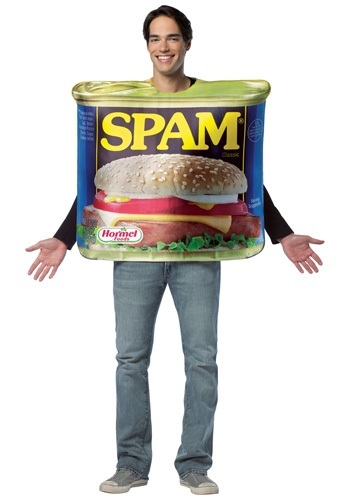 Now if you're a true lover of this amazing food, this costume that makes you look like the can from heaven is for you!